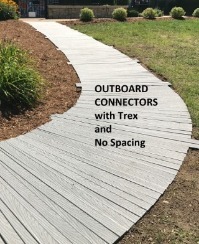 Important note: INBOARD & OUTBOARD Connectors must be ordered with the initial Roll Out Walkway order so that the connecting holes can be pre-drilled during manufacturing. 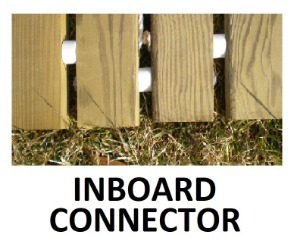 If you think you may want Inboard or Outboard Connectors, simply select CONNECTOR OPTIONS in the appropriate Roll Out Walkway Shopping Cart section and make your choice. 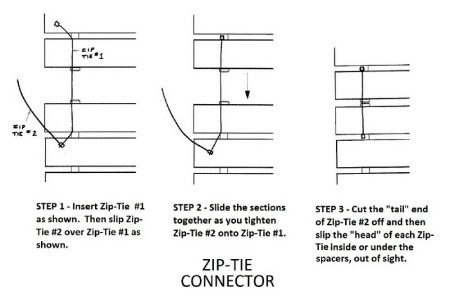 Zip-Tie’s and replacement bolts are also available there. 1. 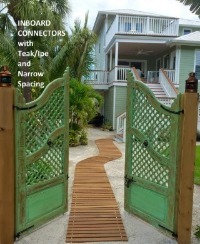 No Connectors – works well for seasonal use, normally by homeowners, where a seamless continuous walkway isn’t necessary and where quick and easy installation and removal is very important. NOT RECOMMENDED FOR COMMERCIAL OR PUBLIC WORKS USE. 2. 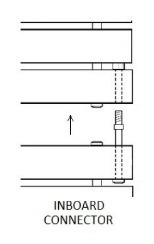 Inboard Connectors - works well for permanent installations, particularly installations that may need occasional removal, i.e. for maintenance or severe storms. 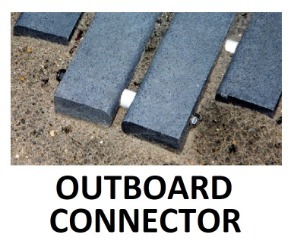 Also works well for temporary use with Wide Spacing and Narrow Spacing However, using OUTBOARD CONNECTORS for temporary use is typically much easier and quicker (see 3. below). 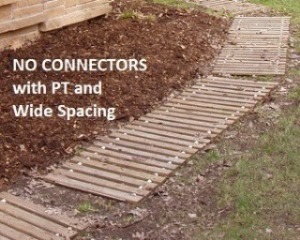 INBOARD CONNECTORS FOR No Spacing ROLL OUT WALKWAYS ARE ONLY AVAILABLE FOR PERMANENT INSTALLATIONS SINCE INSTALLATION & REMOVAL IS SOMEWHAT DIFFICULT. AND, FOR No Spacing WALKWAYS FOR TEMPORARY USE, RIGID DECK TILES MAY BE A BETTER PRODUCT OPTION FOR MANY CUSTOMERS. 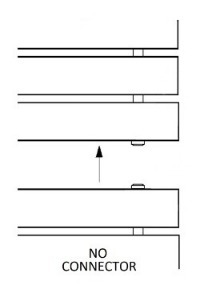 (as shown below) and some customers object to the appearance of the “tabs”. 4. 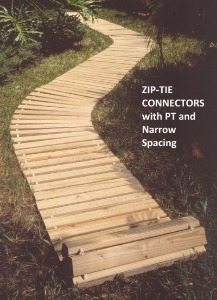 Zip-Tie Connectors – works well for seasonal use by homeowners where a seamless continuous walkway is desired. 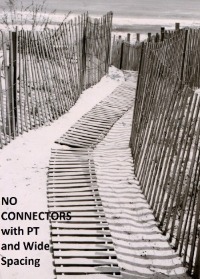 DOES NOT WORK FOR No Spacing ROLL OUT BOARDWALKS.